Permablitz in my rental backyard! It’s official! You don’t need to own your own home to grow your own food. All it takes is a few square metres of a suburban back yard, and you’ll be feasting in no time! 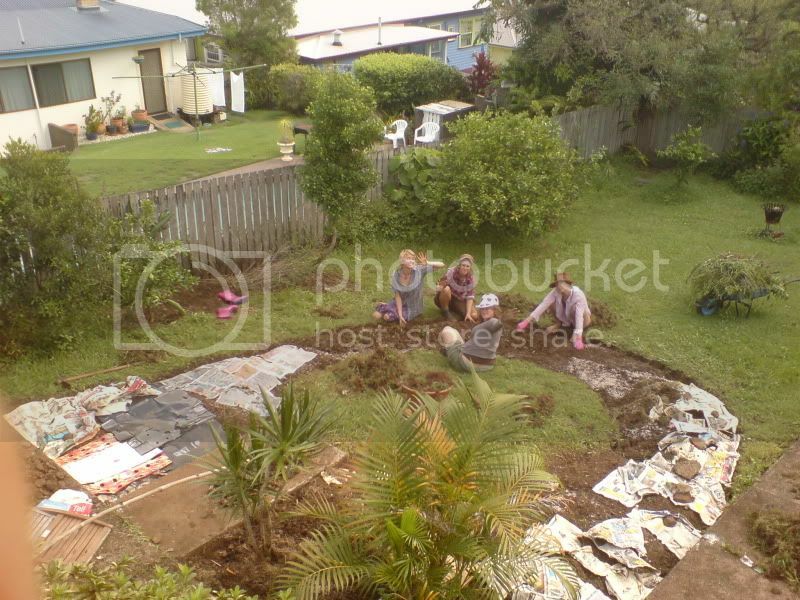 We finally satisfied a bit of our gardening addiction the other day by starting our keyhole/horseshoe bed in the backyard at BatCastle (aka. 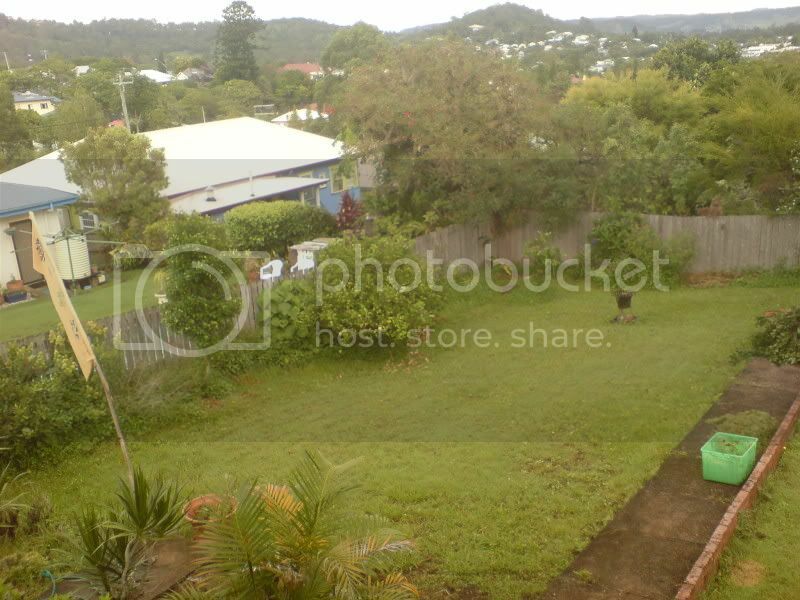 our house in Lismore). 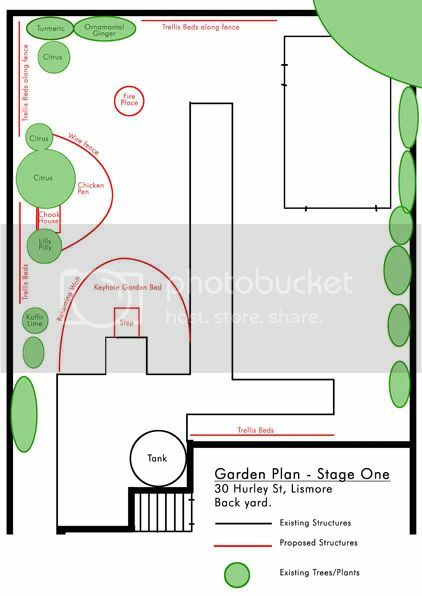 Our only requirement for getting a place in Lismore was that it had to have a back yard for a veggie garden (although, a container garden would’ve also done fine in the case of no yard) – and also that it was out of the flood zone so the plants wouldn’t get washed away! After getting the go-ahead from the landlord after showing him our half-baked plan, we went on down to the Lismore tip to check out their fine range of compost products. Get this: Lismore tip has the biggest worm farm in the Southern Hemisphere! (http://www.ourpatch.com.au/bendigo/users/pippas83/blogs/590-100-million-worms-to-invade-lismore) So, instead of having a weekly wheelie-bin rubbish pickup, the general-waste truck only comes once a fortnight, BUT the Worm Truck comes around to pick up a wheelie bin full of all of our kitchen scraps/paper/greenwaste and compostables every week! How good is THAT? So, anyway Bones and I headed down to the tip to buy some fertiliser that had been made from our own crap (well, they haven’t quite reached the stage of composting ‘crap’ yet in Lismore… but let’s not lose hope) and came back with a few bag loads of worm castings and mulch to get us started. 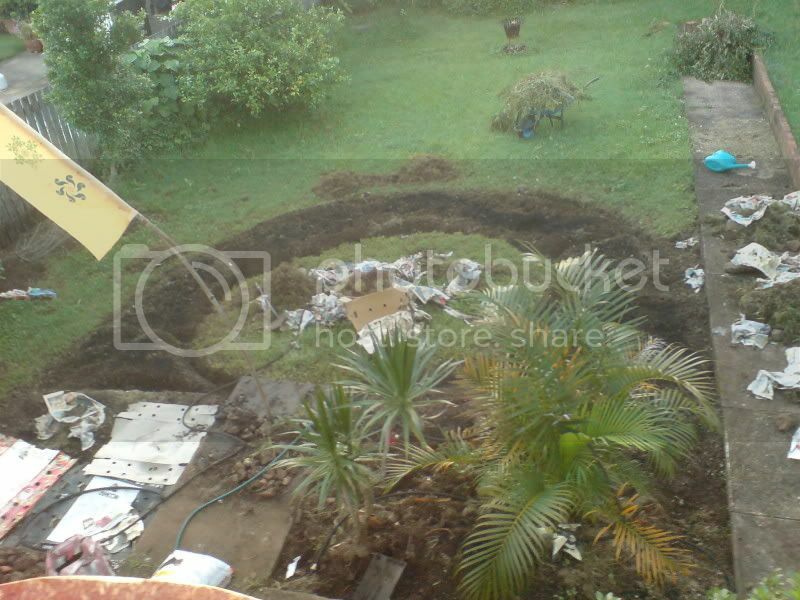 Wielding the rustic second hand mattock and shovels we’d purchased at the car-boot market, we got to work breaking through the heavy waterlogged clay bog that is our back yard. Bit of a difference to working in the dry dusty wastelands of Fremantle that I’ve come to know and love! Suspicious that we were digging something of a giant sealed clay trench that was going to hold every drop of water that fell in it for the next ten years and drown our poor plants, we added a few sprinkles of Gypsum to break things up a bit. The worms could probably do the rest. I swear I’ve found worms nearly half a metre long crawling around in our soil! They’re INSANE! After an exciting day at school learning about soil testing, we decided to get a bit techy and get the pH tester kit out to see what we were working with. It came out slightly acidic, but almost neutral at a pretty decent 6.5. Should be fine for growing most of the things we were keen on! 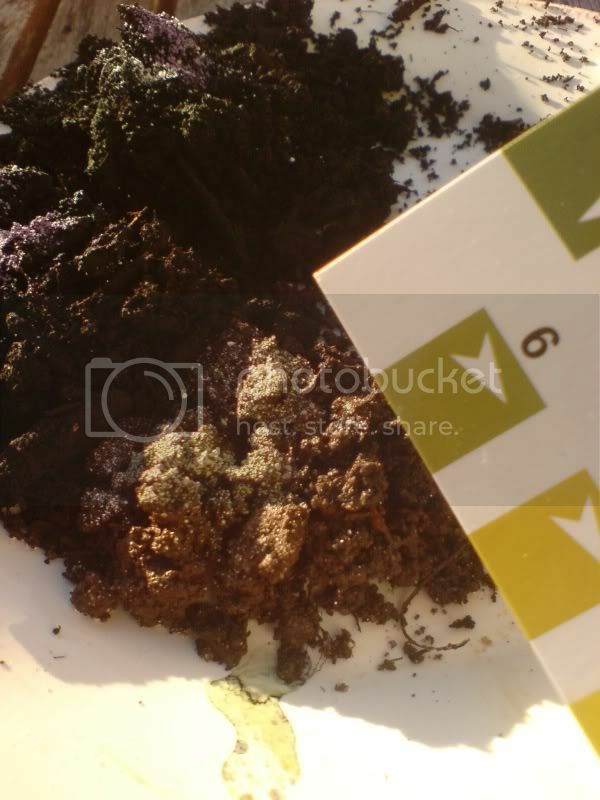 Soil test – not bad at 6.5! Having gone with our initial design of a bit of a keyhole bed going across the weird diagonal downhill slope of our yard, we found that terracing it a bit seemed to help with stopping the water from flowing straight off it and Bones dug out some pretty nifty mini-swales to direct it a bit. Finally, she was ready to go! First bed complete! We got the old companion planting chart down off the toilet door and had a look at what would go well with what. Ended up throwing in a concoction of greens (kale, lettuce, rainbow chard, silverbeet, mizuna, mustard & rocket) with a few things in the out-of-reach spots that we wouldn’t have to harvest for a while like daikon radish (good for busting up heavy soil, as they get massive!) and beets as well as a few herbs like basil, parsley & coriander around the edges for good measure. A couple of days later the nasturtiums sprung up out of nowhere on their own. Sweet. In less than a week’s worth of after-school play-time we had our next 6 months worth of greens sorted! Perfect. Next mission – get chooks! 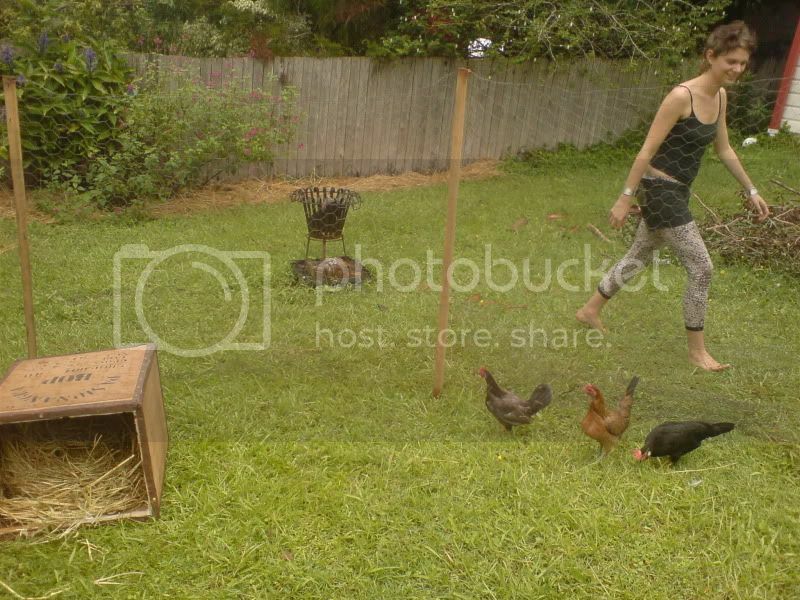 We were originally going to stick the chook yard in between the shed and the fence, but a bit of paranoia set in when we realised that back in the day, people used to spray wooden fences with gnarly termite concoctions – namely Dieldren as well as other cancer-causing-flesh-eating-zombie-chemicals-of-doom. It’s worth being careful, as they can get into your eggs if you keep your chooks on an old fence line and the gnarliness gets amplified when you eat them. So we redesigned it, and build a little fence around one of the citrus trees in the middle of the yard instead. Trundling off to the Channon market on Sunday we hit up the chook guy for a few laying bantams and came home with three cute little mini-chooks that looked like they wouldn’t mind doot-dee-dooing around our little yard for a few months and not escape into our garden. OOPS! Turns out that two of them are super-streamlined, aerodynamic English game-hens with turbo-boosters for spurs and propellers for wattles and within a couple of minutes of getting them into their yard, one of them took off and flew up into the air about 15 metres, landing in a nearby tree, where she has now decided she will reside! Aagh! Not sure if a trade-in or just some mesh over the yard is in order, but our story shall continue when we find out what part of the tree she’s in! So there you go. A (mostly) successful story proving that even the most transient gypsies are able to put in a nice little backyard permaculture garden. 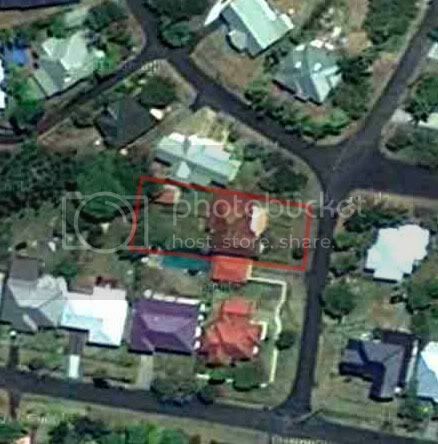 If you haven’t got land at all, (or if you’ve got too much land!) I recommend checking out Landshare. It’s a great tool for hooking up landless people who want to grow food with land-owners wanting people to grow food! We’ll let you know when our food-abundance is overflowing! Thanks for listening. We’ll be back with more soon! I appreciate your efforts you raise on the rental backyard. Hey Buddy!, I found this information for you: "Permablitz 1". 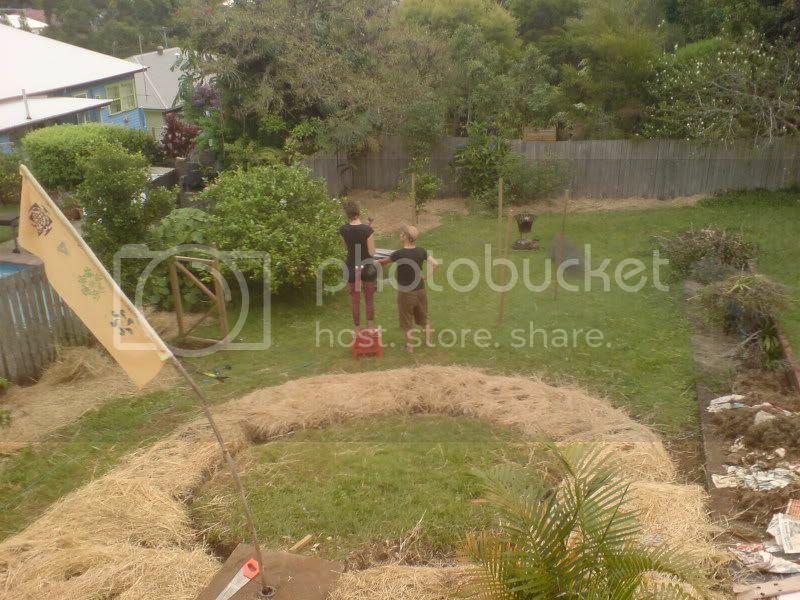 Here is the website link: https://permaculture.com.au/permablitz-in-my-rental-backyard/. Thank you.